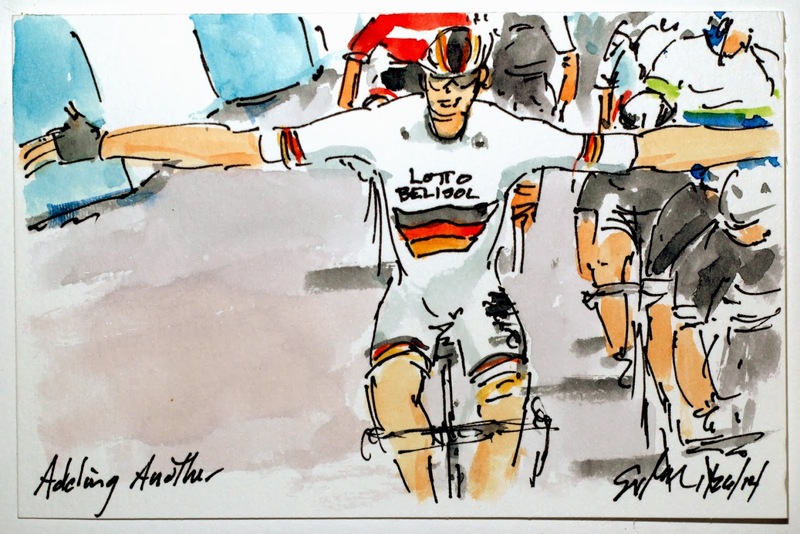 Andre Greipel (Lotto Belisol) had told Paul Sherwen that he had a plan for the final sprint of the Tour Down Under and apparently it was the right plan. So he was the one to raise his arms in a victory salute on the streets of Adelaide (for the stage). A few more bikes back it was Simon Gerrans pumping his fists in the air as he claimed the over all win of the Santos Tour Down Under. Both riders set new records with Gerrans clinging his third win of the overall (a new record) and Greipel won his 16th stage the most stage wins of any rider in the Santos Tour Down Under. 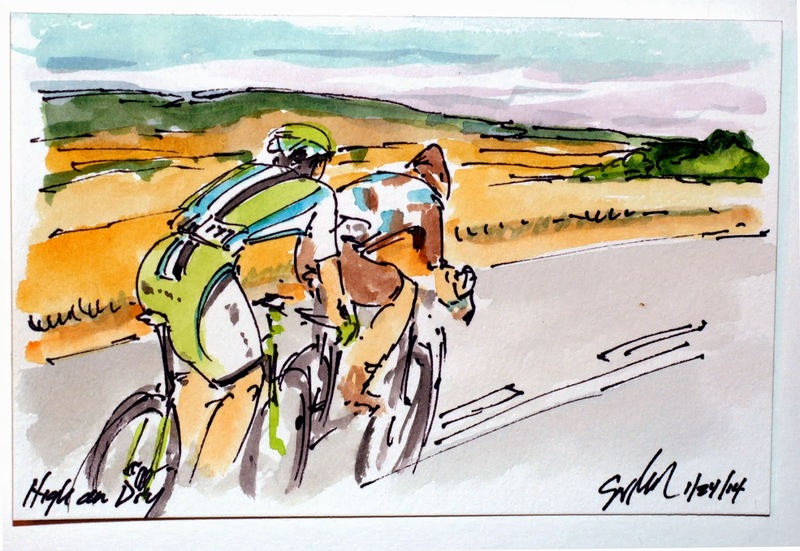 I have enjoyed this race and I hope that you have enjoyed my paintings of this wonderful battle on two wheels. And thank you to www.cycling.tv for access to the race and to Phil Ligget and Paul Sherwen for their entertaining, insightful and informative commentary. This is an original watercolor and ink postcard that could be yours by visiting my artist web site at www.greigleach.com or you could just follow the direct link at the end of this post. 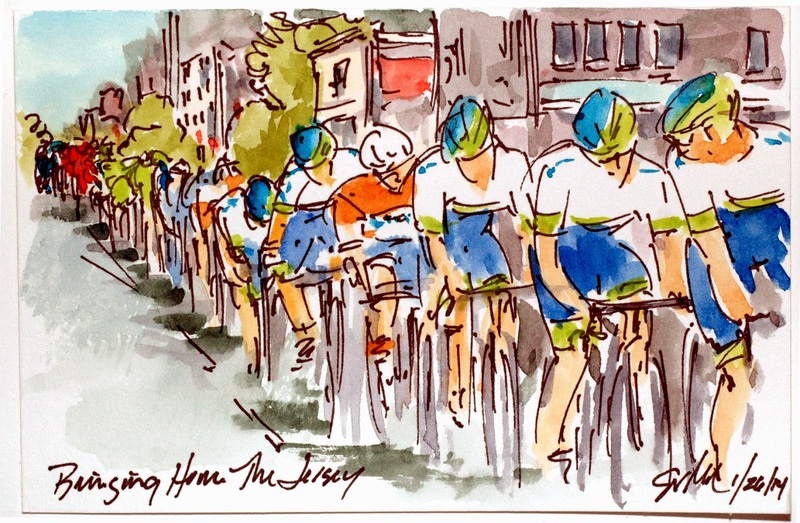 With all but the final sprint to contest Orica-Greenedge and Simon Gerrans could begin to believe that they had secured the Ochre Jersey and the over all win of the Tour Down Under. At this point they are only about 5 kilometers away from the magical point in the rules were even with a crash all of the riders will be given the same time as those they were with at the finish line. Orica-Greenedge knows that the sprinters will be able to best any of the other GC contenders that are in need of the seconds on offer at the finale. So, Chapeau, Orica-Greenedge and Simon Gerrans! This is an original watercolor and ink postcard that could be yours by visiting my artist website at www.greigleach.com. Or you could just follow the direct link at the end of this post to get your piece of the Santos Tour Down Under. Once the break had been caught it was time for some full on racing as the sprinter and their teams began fighting for position. With all of the effort going into getting their lead out trains organized the speeds started to reach 50 kph, it got to be real hard to hold onto the back of the peloton. 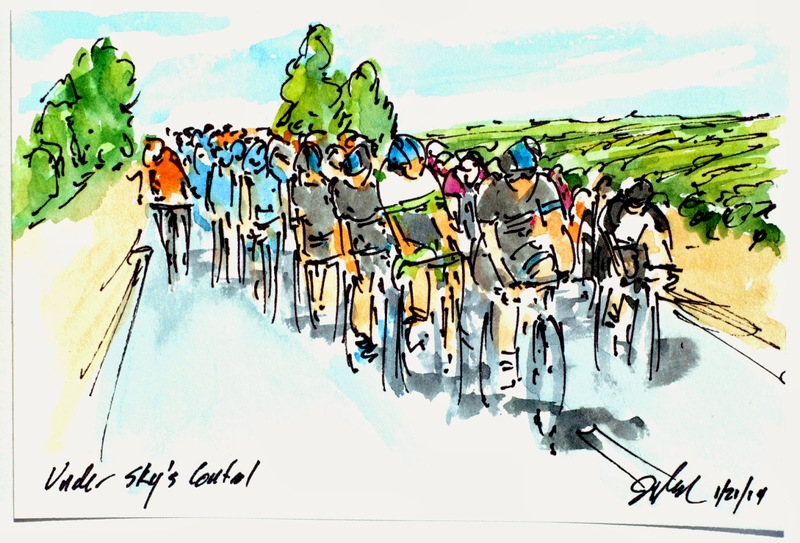 The peloton moves almost like a flock of birds and the shape can tell you the story of what is happening at anytime in the race. And when it is stretched out in a long line like this, the speed is full on. This is an original watercolor and ink postcard that could be yours by visiting my artist website at www.greigleach.com Or you could just follow the direct link at the end of this post. The unsung heroes of the pro tour are the race mechanics, these men and women are called upon to fix most anything at anytime often times at high speeds. I wonder how often they fall out of car while trying to reach just a little too far. This takes amazing coordination between the driver of the team car, the racer and the mechanic and then there is the problem solving that must be done quickly and successfully under a great deal of pressure. Here the AG2R team mechanic is tending to the rear brakes of Maxime Daniel at the back of the peloton on the streets of Adelaide. This is an original watercolor and ink postcard that could be yours by visiting my artist website at www.greigleach.com or you could just follow the direct link at the end of this post. Team Sky decided it was time to go get the three man break away before they grabbed the bonus seconds from the first intermediate sprint. Their man, Richie Porte, started the day in 4th place needing to gain only four seconds to get on to the final podium. Surprisingly, after two laps they hadn't put anytime into the trio up the road so they threw in the towel. This is an original watercolor and ink postcard that could be yours by visiting my artist web site at www.greigleach.com or you could just follow the direct link at the end of this post. Today's circuit race was an 18 lap rip through downtown Adelaide with two intermediate sprints with time bonuses in addition to those at the finale. With only one second separating first and second and a total of ten seconds between first and fourth position, it was sure to be hotly contested all the way through town. However, a three man break got away and as a special favor to Simon Gerrans and his Orica-Greenedge team, they sucked up all of the sprint bonuses ensuring the overall for Gerrans. William Clarke (Drapac) finished the race the way he started the Tour by getting himself into his third breakaway of the six stage Tour Down Under. 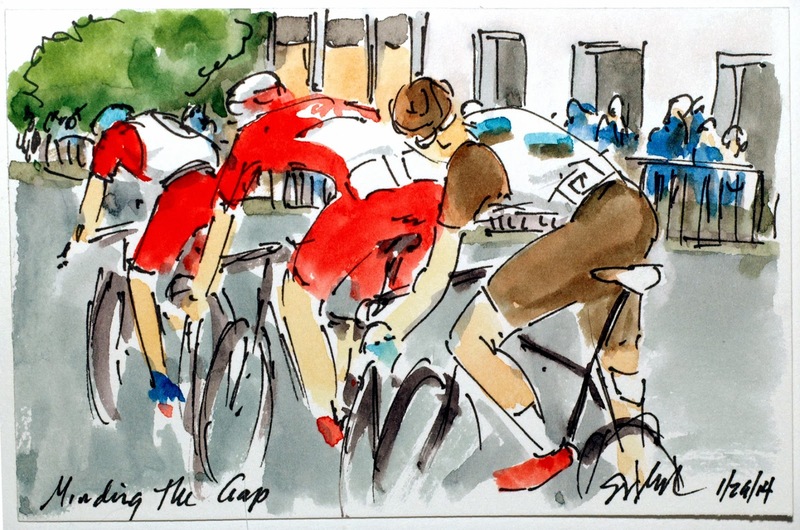 He was joined in the effort by Julien Berard (AG2R) and Maxime Belkov (Katusha). This is an original watercolor and ink postcard that was created using cake watercolors from www.richesonart.com and it can be yours by visiting my artist web site at www.greigleach.com Or you could just follow the direct link at the end of this post. After Cadel Evans rode everyone off of his wheel on Corkscrew Hill, including the Team Sky leader, Richie Porte, it was time for a little revenge. 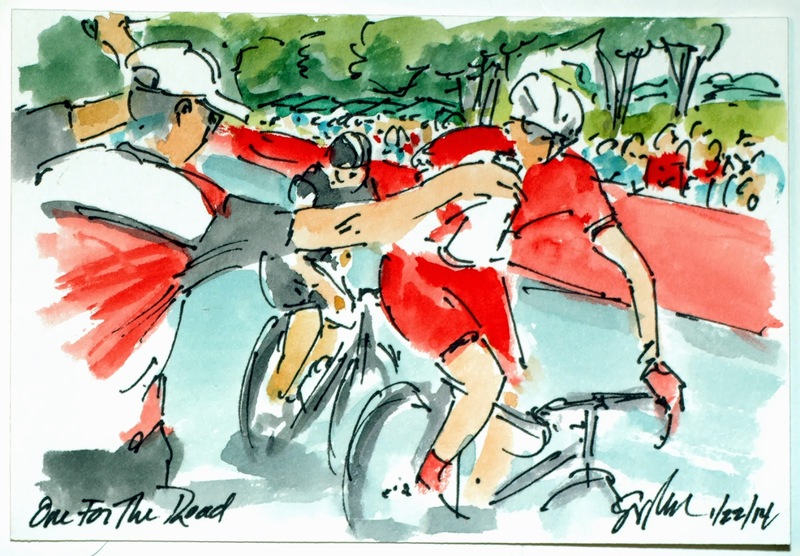 As I showed in the previous painting, Cadel attacked first and then Porte was able to counter the move and then exact his revenge and ride Cadel and the rest of the contenders off of his wheel. With most thinking that the Willunga Hill stage would be the decisive stage of the Tour Down Under it actually narrowed the gaps and set up a very competitive final stage of the Tour. As I said, Cadel's attack didn't give him the results he wished for leaving the door open for Simon Gerrans counter move that was enough to take back the leader's Ochre Jersey by one second. So as the peloton lines up for the start of the final stage only 5 seconds separate the top three place riders on GC, Simon Gerrans (Orica-Greenedge), Cadel Evans (BMC) and Diego Ulissi (Lampre). 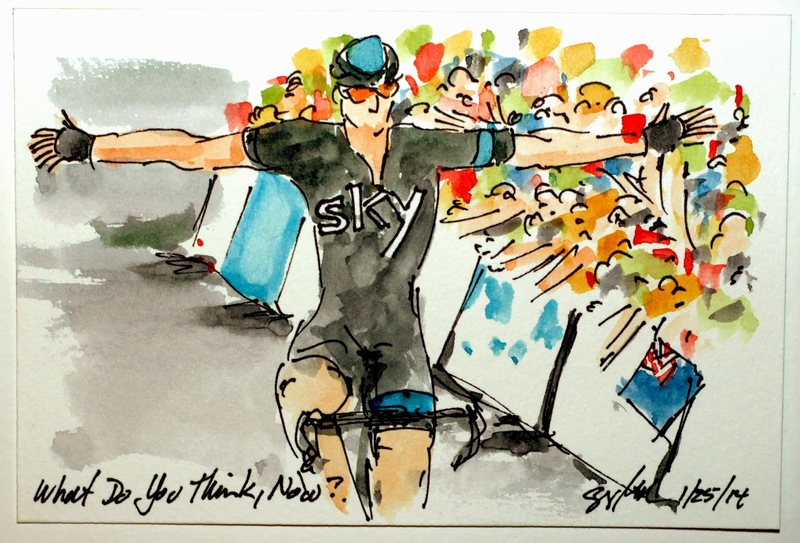 Richie Porte's win of stage 5 moved him up to fourth place trailing by just 10 seconds. This is an original watercolor and ink postcard that could be yours by visiting my artist website at www.greigleach.com. Or you could just follow the direct link at the end of this post. At the base of the final climb up Old Willunga Hill and the lead of the Tour Down Under up for grabs, Team BMC and Cadel Evans decided to surprise the peloton, the contenders and even the commentators by attacking rather than just defending his position and sticking to the wheels of his two closes adversaries in the overall general classification. Unfortunately the bold move wasn't to pay the dividends he hoped for. At least this should dispel the belief that Cadel never attacks and lnly races defensively. This is an original watercolor and ink postcard that could be yours by visiting my artist website at www.greigleach.com. Or you could just follow the direct link at the end of this post. With three out of the four from the original break surprising the peloton by getting over the Old Willunga Hill climb without getting caught. 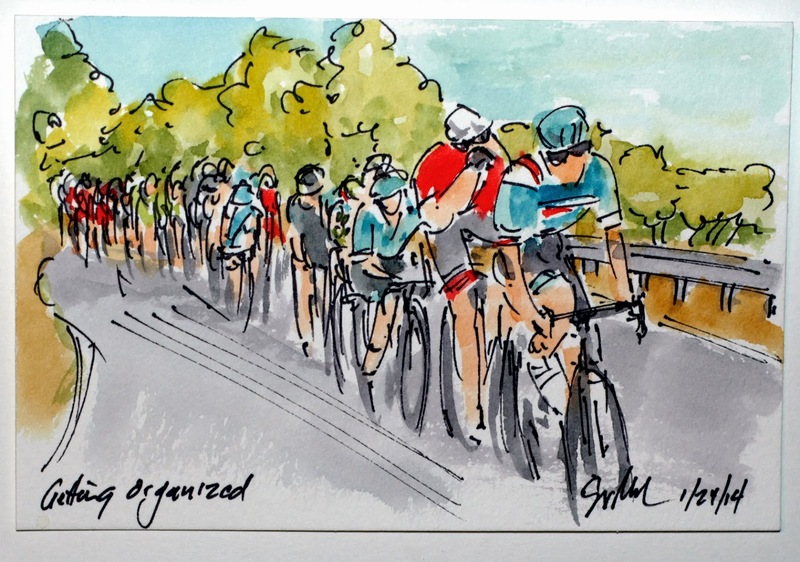 As they started back down the other side hitting speeds of 100 kph, Matteo Trentin (OPQS) kept looking over his should trying to find the peloton charging up behind. Jens Voight, on the front, just kept stomping out the rhythm letting the catch come when it may. This is an original watercolor and ink postcard that could be yours by visiting my artist website at www.greigleach.com. Or you could just follow the direct link at the end of this post to get your piece of Jens' last season. Even with race radio and two way communication between the riders and their team cars, there is still two people on a motorcycle going from group to group on the road showing the time splits on a chalkboard (or in this case a wipe board). Today's break was comprised of the old man of the peloton, Jens Voight (Trek) as well as, Mikhail Ignatyev (Katusha), Juan Jose Lobato (Moviestar) and Matteo Trentin (Omega Pharma Quickstep) who managed to build up an advantage of nearly 10 minutes before the teams of the contenders decided it was far enough. This is an original watercolor and ink postcard that could be yours by visiting my artist website, www.greigleach.com or you could just follow the direct link at the end of this post to get your piece of Voight's final season. 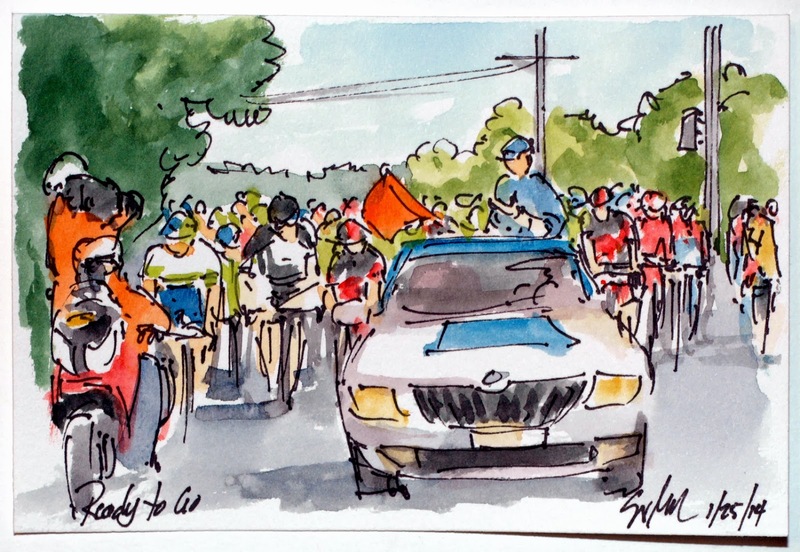 With so much on the line in today's stage, the race coverage started with the Neutral Rollout. Once that has been covered the Race Commissare drops the flag to single the start of full on racing. This starts a day in the saddle that will end with a mountain top finish ensuring a shack up in the overall standings and crowning the King of the Mountains for the Santos Tour Down Under. This is an original watercolor and ink postcard that was created using cake watercolors from www.richesonart.com. It can also be yours by visiting my artist website, www.greigleach.com or by following the direct link at the end of this post. 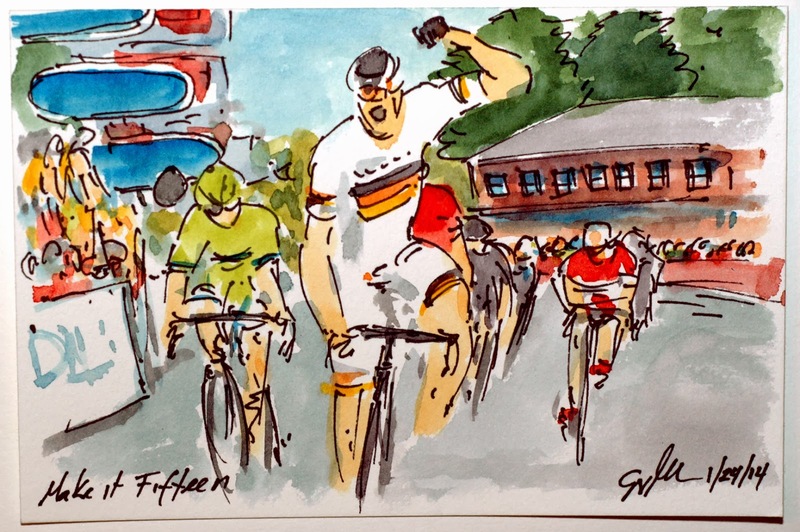 The big German sprinter, Andre Greipel (Lotto) finally had the right approach to the finish line to show why he is one of the fast men of the pro peloton. 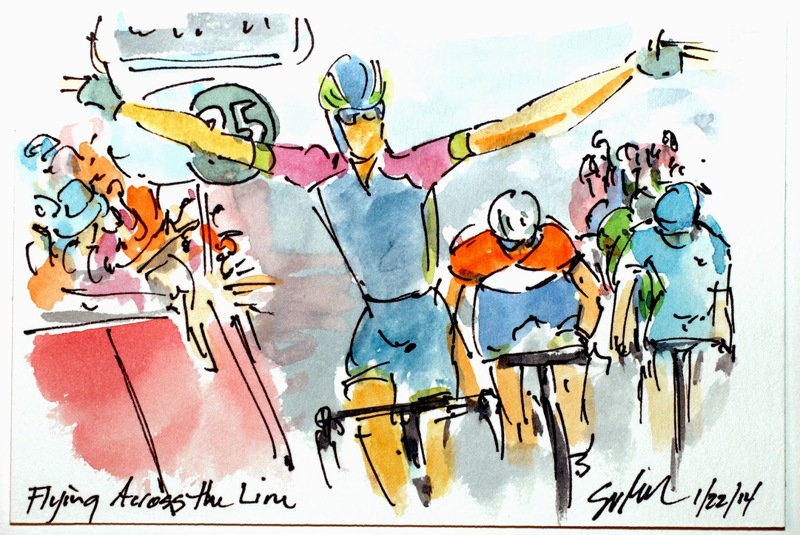 Not quite having the balance for the two arm salute, he celebrated his fifteenth stage victory in the Tour Down Under with a fist pump and a firm grip on the handle bars. He managed to just nip Elia Viviani (Cannondale) and Nathan Haas (Garmin Sharp) fortunately for Cadel Evans, Simon Gerrans wasn't able to pick up anymore bonus seconds on the stage. 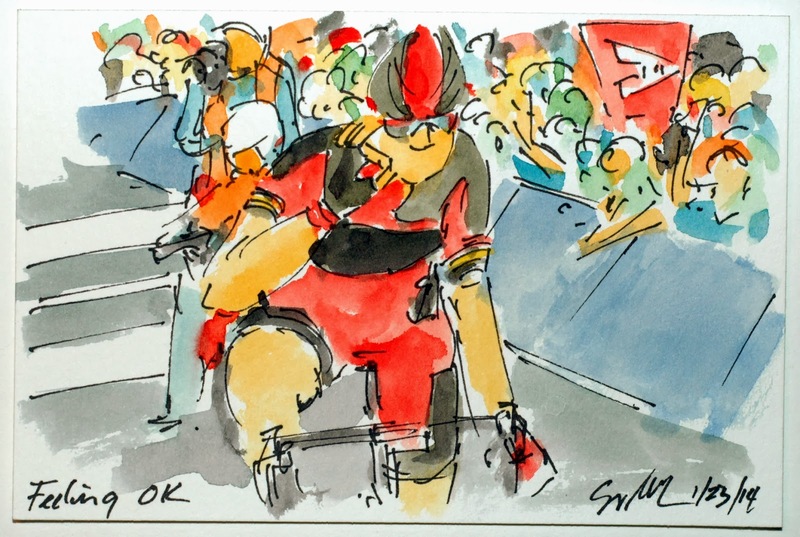 His lead-out man, Jurgen Roelandts, did such a strong ride that he managed to cross the line in third on the stage. So that leaves the Ochre leader's jersey on the shoulders of Evans by seven seconds. This is original watercolor and ink postcard that could be yours by visiting my artist website, www.greigleach.com or you could just follow the direct link at the end of this post. With just under three kilometers to go it's time for the sprinter's teams to come to the front of the peloton and drive up the pace. Then to set up their final lead-out men to carry their man out of the wind, rested and ready to lay it all out for the win. It was left to Garmin-Sharp for Haas and Lotto for the German National Champion, Andre Greipel. Notice the Lotto rider in red, trying to get more calories in for a final burst of speed. This is an original watercolor and ink postcard that could be yours by visiting my artist website, www.greigleach.com or you could just follow the direct link at the end of this post. Wearing the Blue Jersey of Sprint Leader but hoping to pull back on the Ochre Jersey of race leader, Simon Gerrans contested every sprint in Stage 4 of the Tour Down Under grabbing 3 seconds at the first sprint, and 1 more in this sprint. Nathan Haas (Garmin Sharp) and Elia Viviani (Lampre) laid in wait and showed their sprinter's legs to beat him to the sprint point. Cadel Evans (BMC) wearing the Ochre Leader's Jersey kept a watchful eye on the proceedings, however it seems that he may have had a mechanical just as he tried to accelerate to challenge in the sprint. He changed bikes shortly after the sprint point. 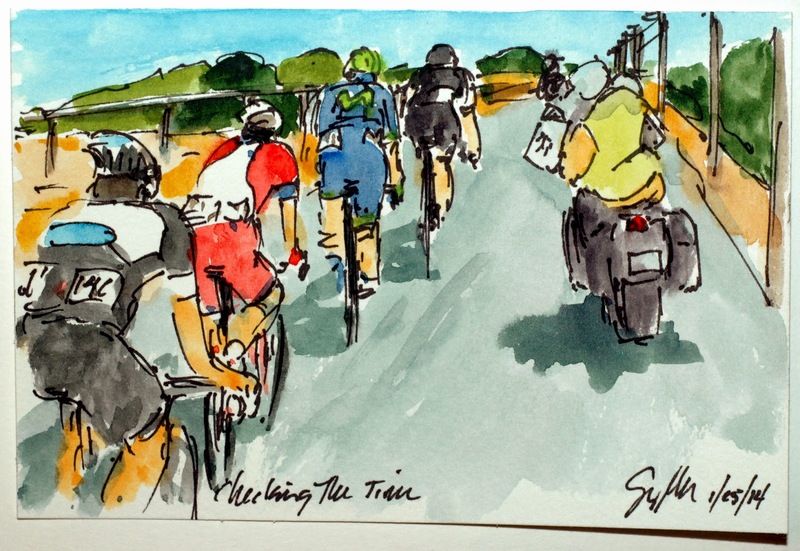 This is an original watercolor and ink postcard that could be yours by visiting my artist website, www.greigleach.com or you could just follow the direct link at the end of this post to get your piece of the Santos Tour Down Under. 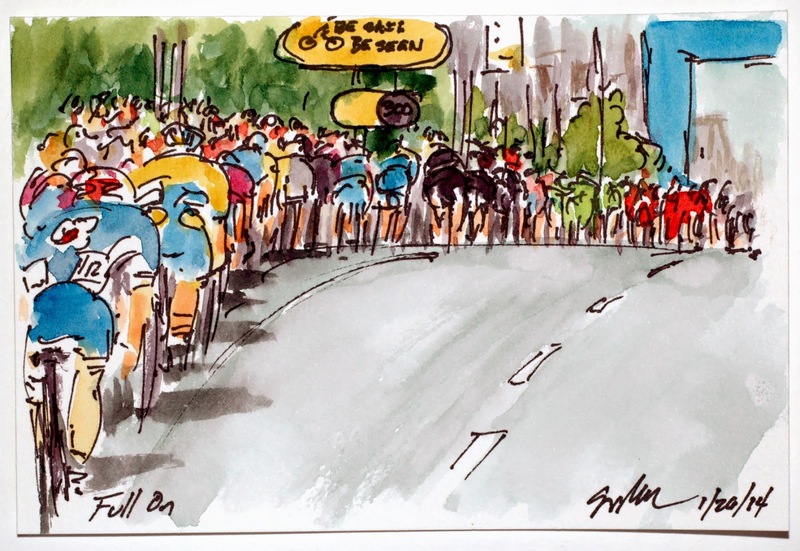 Unlike the Tour du France, the Tour Down Under offers bonus time for both the intermediate sprints and to the top three finishers at the end of each stage. With just 15 seconds separating Cadel Evans and Simon Gerrans, Orica-Greenedge was setting up to carry their man across the intermediate sprint first. Unfortunately for them Elia Viviani (Cannondale) and Nathan Haas (Garmin Sharp) had something to say about it, leaving Gerrans third place and just 3 seconds bonus. 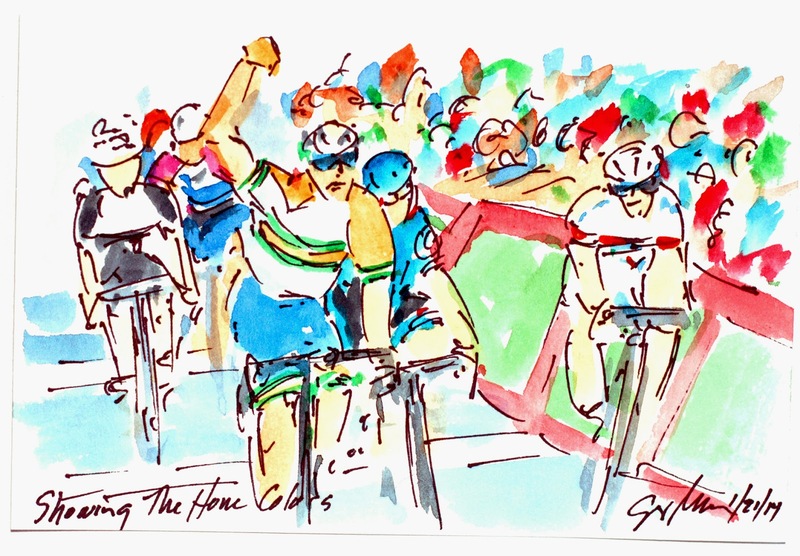 This painting is the lead-out men making sure they have their sprinters in tow as they wind up the pace. This is an original watercolor and ink postcard that could be yours by visiting my artist website, www.greigleach.com or you could just follow the direct link at the end of this post to get your piece of the Tour Down Under. 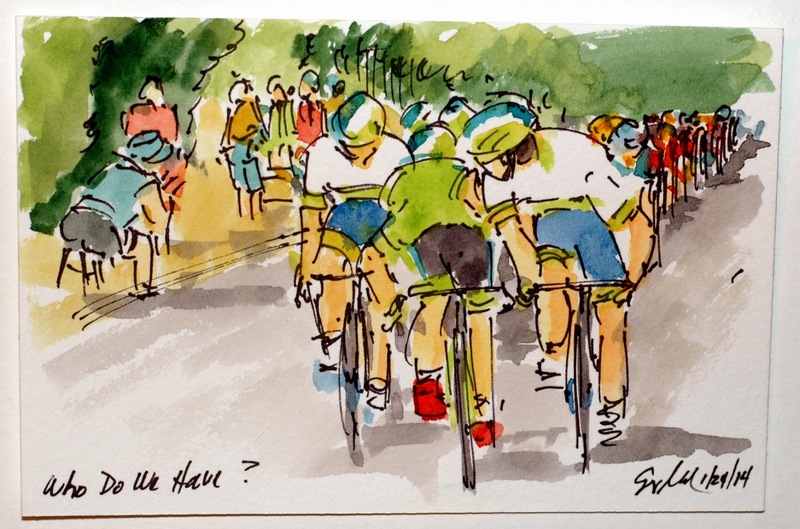 With the full heat of summer on in southern Australia and the area experiencing a prolonged drought, it is a sea of brown grasses with islands of green trees that surround the fight for KOM points on the only climb of Stage 4. Cameron Wurf (Cannondale) and Axel Domont (AG2R) ridded themselves of their three breakaway companions to make the climb together. 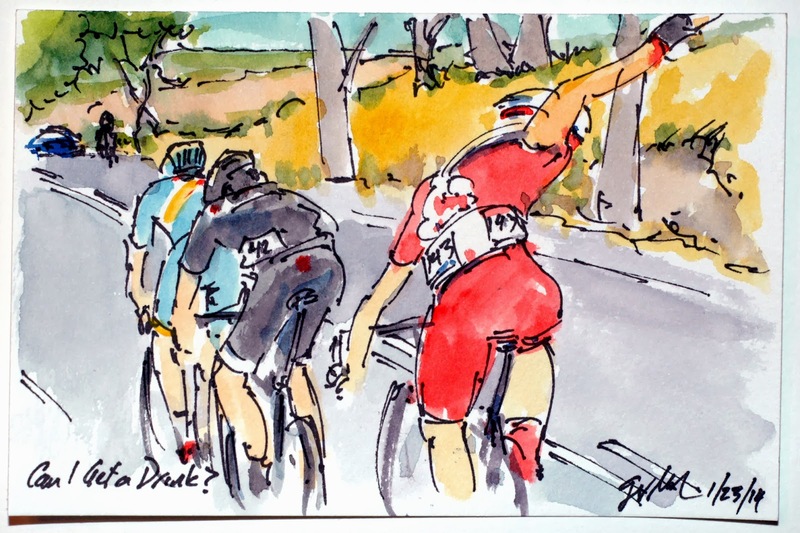 With Domont cresting the Myponga ridge first, he was sure he had gained enough points to take over the Green Polka Dot jersey of the King of the Mountains leader, only to discover that Adam Hansen made it over in third place to just hang on to the jersey on his back. This is an original watercolor and ink postcard that was created using cake watercolors from www.richesonart.com. It can be yours by visiting my artist website at www.greigleach.com or you could just follow the direct link at the end of this post to get your piece of the Tour Down Under. Cadel Evans used his team, his climbing ability, his descending ability and his experience to win the stage by 15 seconds. With time so important he forsook the traditional two armed victory, instead pedaling across the finishing line at full speed. Only after stopping the clock did he flash the universal sign for feeling okay about his race. The 15 seconds ahead of the charging contenders and the additional 10 second time bonus for winning the stage put Cadel into the Ochre Jersey of race leader of the Tour Down Under. This is an original watercolor and ink postcard that could be yours by visiting my artist website, www.greigleach.com, or you could just follow the direct link at the end of this post. Cadel Evans went into the stage with a plan and a team that helped him realize his goal. Having used the rest of BMC to push a super high pace up Corkscrew Hill it was left to him to launch the final attack before the summit of the climb. When he went it was only Richie Porte that could hang onto his wheel, initially helping with the pace setting. 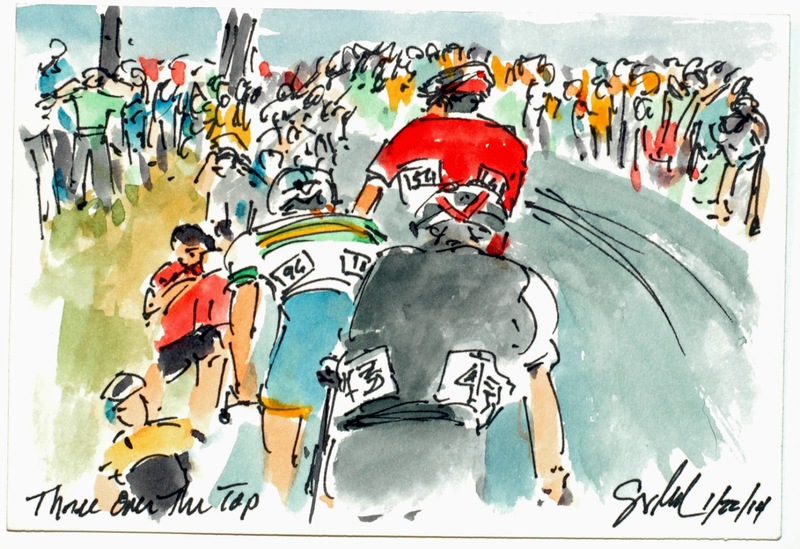 But in the end, it was Cadel that rode the complete peloton off his wheel, not only up the hill but down as well. This is an original watercolor and ink postcard that could be yours by visiting my artist website, www.greigleach.com or you could just follow the direct link at the end of this post to get this small piece of the Tour Down Under. Those who don't understand the ins and outs of bike racing do realize how much of a team sport it actually is. BMC showed that they had a plan and the team to make it work today. They were able to put rider after rider on the front to push the pace and rid rider after rider from the contention. Here it is the Swiss rider, Moribito, bending himself inside out for his team leader, Cadel Evans as they storm up Corkscrew Hill. This is an original watercolor and ink postcard that could be yours by visiting my artist website, www.greigleach.com Or you could just follow the direct link at the end of this post. 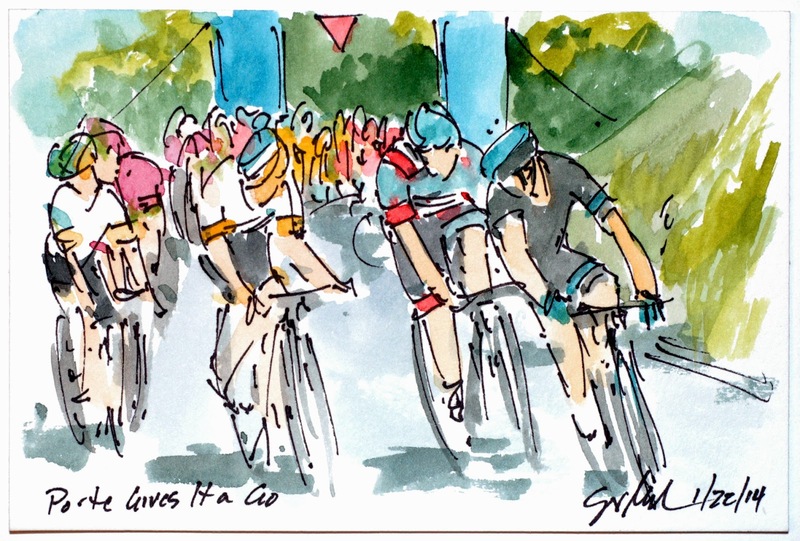 While you are there, why not look around at all of the cycling art on offer. With temperatures in the nineties it is important for the riders to keep their fluids high, without it they risk cramps, bonking and losing the ability to recover before racing the next day. 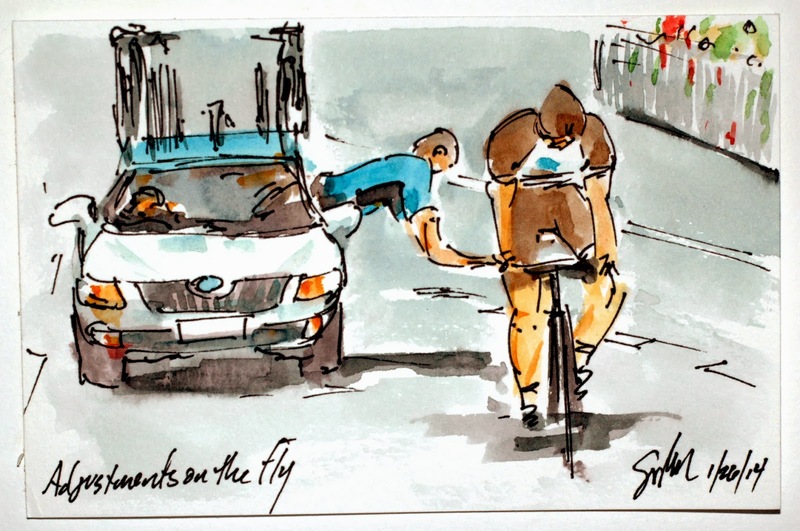 While the riders have two way radios to keep in touch with their Director Sportif, it is still tradition for the racer to raise his arm to call the team car forward. The break as already dropped Jerome Cousin, who coming from winter in Europe, had not acclimated to the heat of the Australian summer. 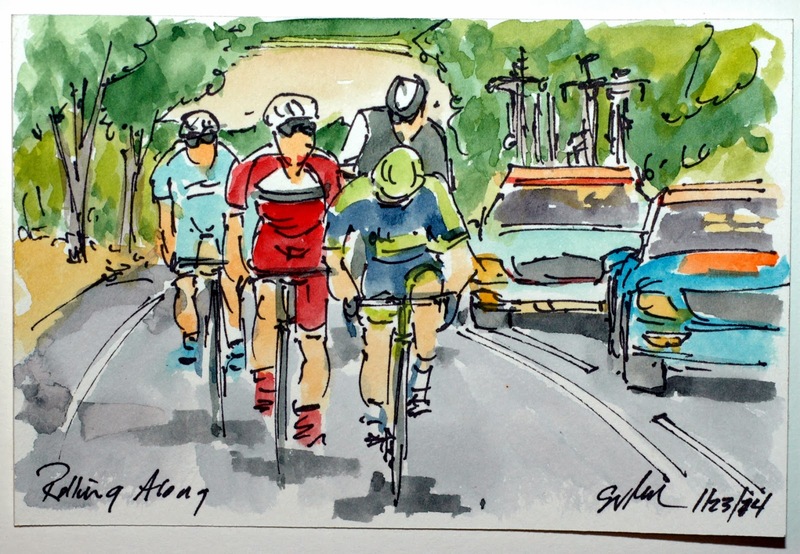 So now the break is down to Grivko (Astana), Voight (Trek) and Meyer (Drapac). This is an original watercolor and ink postcard that could be yours by visiting my artist website, www.greigleach.com or you could just follow the direct link at the end of this post. 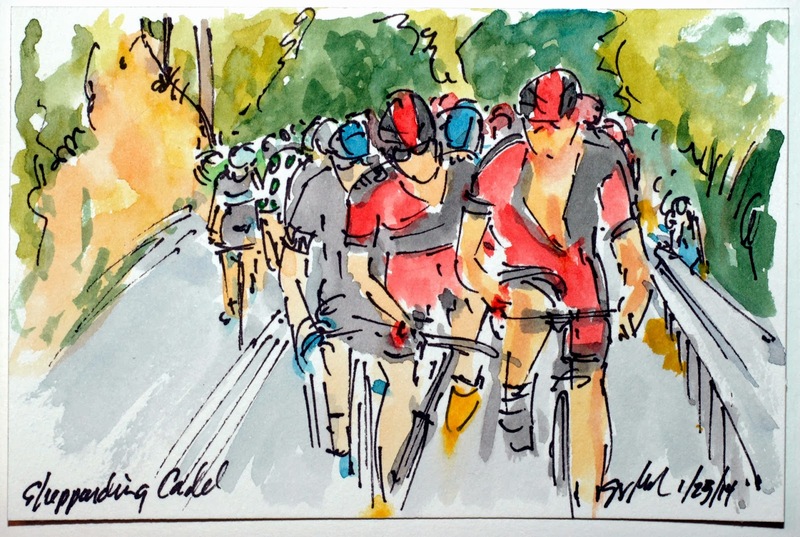 With a steep climb of Corkscrew Hill facing the peloton at the end of a longer day in the saddle, it took some strong riders to hope to stay away to the finish. The big guy at the back is one of the strongest, Jens Voight (Trek) along with the Astana rider, Andriy Grivko. They were joined (actually they joined) Travis Meyer (Drapac) who got the break started and Jerome Cousin (Europcar), but it was the two veterans that weren't caught until the wind up to the final climb. The peloton and the breaks are escorted by their team cars (complete with spare bikes and wheels) and a race referee. This is an original watercolor and ink postcard that was created using cake watercolors from www.richesonart.com In addition it can be yours by visiting my artist website, www.greigleach.com or you could just follow the direct link at the end of this post. With Greipel out of the picture due to a puncture and the GC men trying to gain seconds in real time and bonus seconds, Diego Ulissi was able to get the jump on everyone. He even had enough time to throw out his arms in a victory salute as he glided across the line. Hidden by this view is Cadel Evans slidding in ahead of the Ochre Jersey of race leader, worn by Simon Gerrans. Gerrans' third place was enough to keep in the leader's jersey. This is an original watercolor and ink postcard that could be yours by visiting my artist website at www.greigleach.com, or you could just follow the direct link at the end of this post. With just one kilometer left to go, Richie Porte tries to jump away to regain the four seconds that he lost in stage one however, Orica-Greenedge, Hass and Ulissi weren't having any of it. They quickly jumped on to his wheel and neutralized the attack. This is an original watercolor and ink postcard that could be yours by visiting my artist web site at www.greigleach.com. 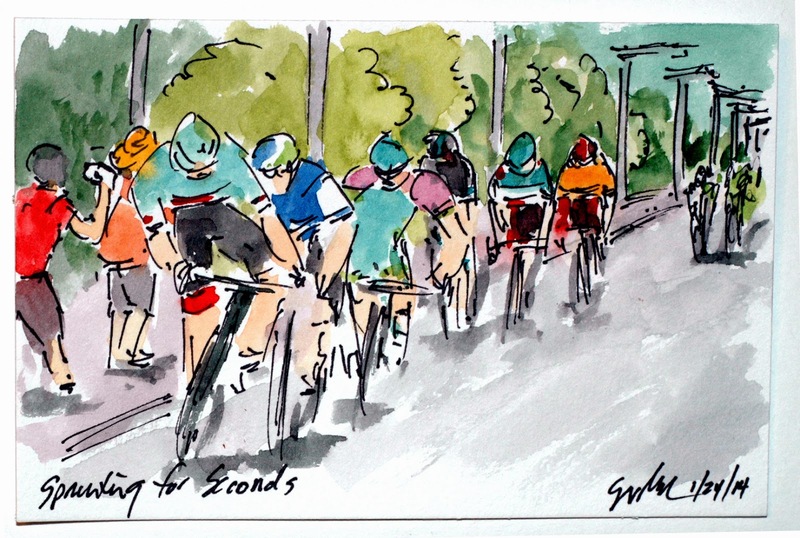 Or you could just follow the direct link at the end of this post to get your original cycling art. After the peloton enter into the Bell Lap a small group of GC teams jumped out to try to ride themselves of as many sprinters as possible. 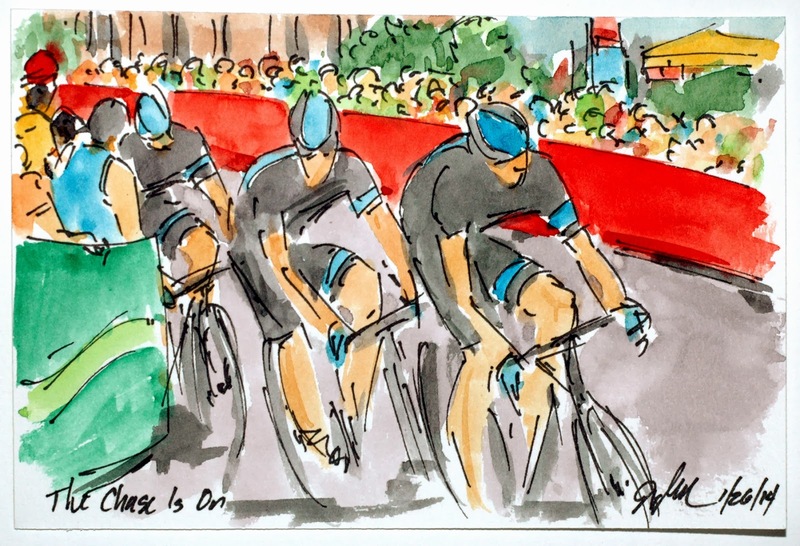 So Porte's, Evans' and Garrans' teams along with Garmin-Sharp set out in hopes of pulling off the surprise move. This is an original watercolor and ink postcard that could be yours by visiting my artist website at www.greigleach.com or you could just follow the direct link at the end of this post. After making the steep climb up to where the finish line will be on the third lap the team helpers lined up to pass out water bottles at 40 kilometers per hour. This is William Clarke grapping a bottle from the Drapac team worker. 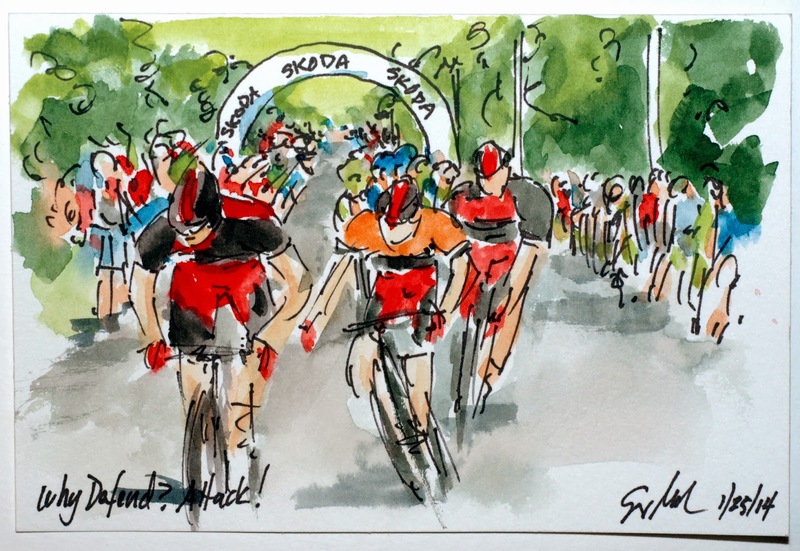 With less than twenty kilometers to go, the riders are no longer allowed to get bottles or food from their team cars, so their only hope for another drink is from either the neutral service vehicle or from the side of the road. This is an original watercolor and ink postcard that could be yours by visiting my artist website, www.greigleach.com or you could just follow the direct link at the end of this post. The early break of three riders included William Clarke (who spent all of Stage One out in front) along with Boy Von Poppell (Trek) and Campbell Flakemore (Uniesa). Clarke and Flakemore fought it out for KOM points in the early kilometers of Stage 2 before the peloton made the catch with about 15 kilometers to go. 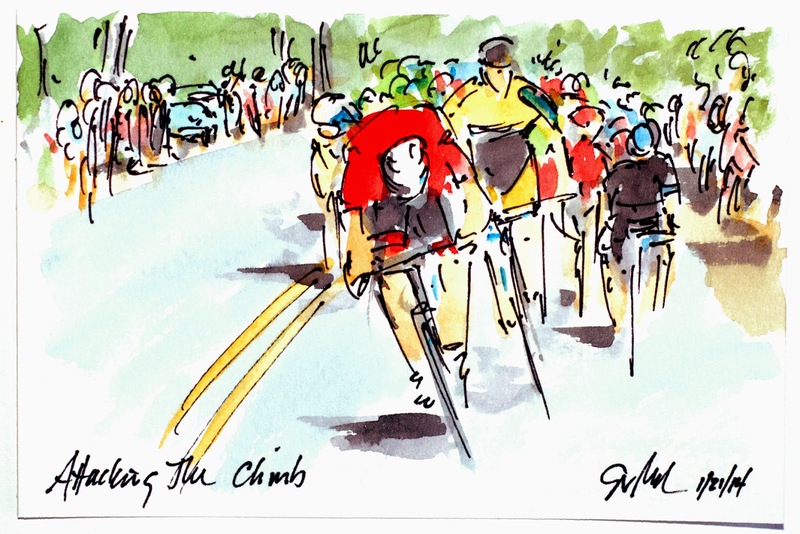 At this point they are cresting the climb up Checker Hill. This is an original watercolor and ink postcard created using cake watercolors from www.richesonart.com and can be yours by visiting my artist website at www.greigleach.com. Or you could just follow the direct link at the end of this post. Wearing the Australian National Champion Jersey that he had won just two weeks earlier, Simon Gerrans takes the sprint ahead of the powerful Andre Greipel (Lotto) and Steele Van Hoff (Garmin) with Diego Ulissi (Lampre) pulling fourth in the finale of the first stage of the Tour Down Under. 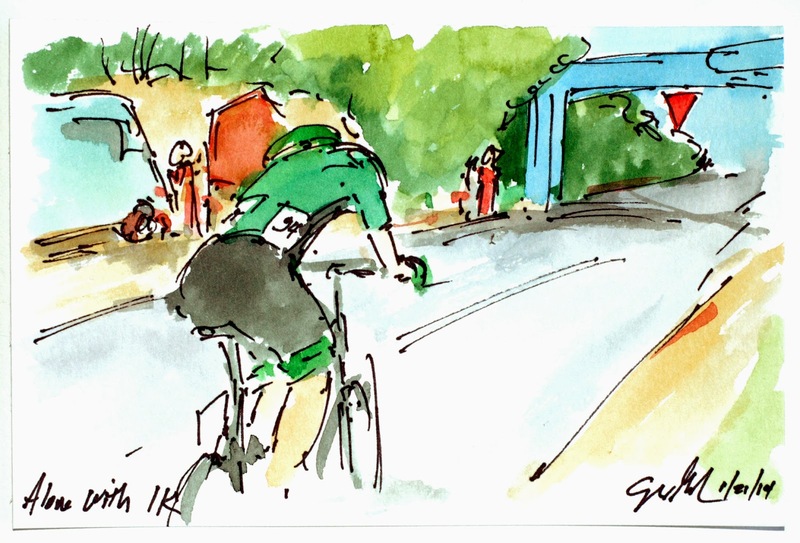 I think the Gerrans surprised even himself by getting around Greipel who had a great lead out and the early jump. This is an original watercolor and ink postcard that you could call your own by visiting my artist website at www.greigleach.com or you could follow the direct link at the end of this post. After attacking with his Europcar teammate, Bjorm Thurau looks over his shoulder to discover just how much gap he had with the one kilometer to go banner just ahead. Unfortunately for Thurau it was a long drag up to the finishing straight and his break had cost him too much to hold off the charging sprinters. This is an original watercolor and ink postcard that could be yours by visiting my artist web site, www.greigleach.com or by just following the direct link at the end of this post. After all of the positioning, attacks and three hours of racing the peloton had sucked up the breakaway and hit the only climb of the day, Menglars Hill. With first Garmin and then Sky trying to set it up for their man, it was Adam Hansen of Team Lotto that jumped from the reduced peloton to grab the KOM points (and the jersey) of the Tour Down Under. This is an original watercolor and ink postcard that can be yours by visiting my artist web site at www.greigleach.com or just follow the direct link at the end of this post. 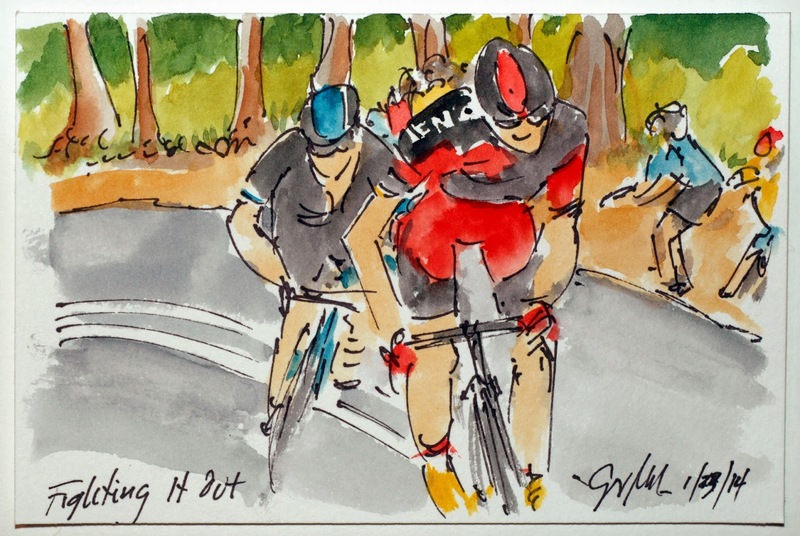 With two riders out in front, Team Sky got to the business of setting a fast tempo hoping to soften up the legs of the sprinters and position Richie Porte for the final climb up Menglars Hill. 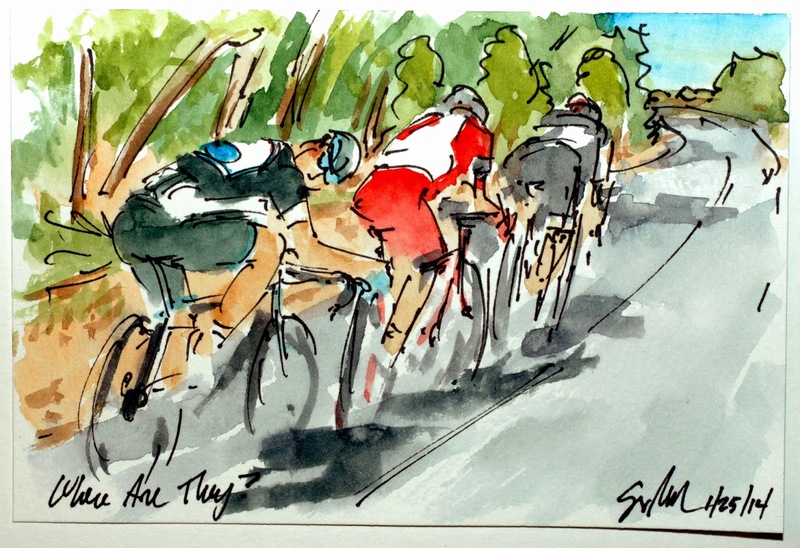 The approach to the climb took the peloton through the Barossa Valley and the vineyards of Southern Australia. This is an original watercolor and ink postcard that could be yours by visiting my artist web site at www.greigleach.com or just follow the direct link at the end of this post. 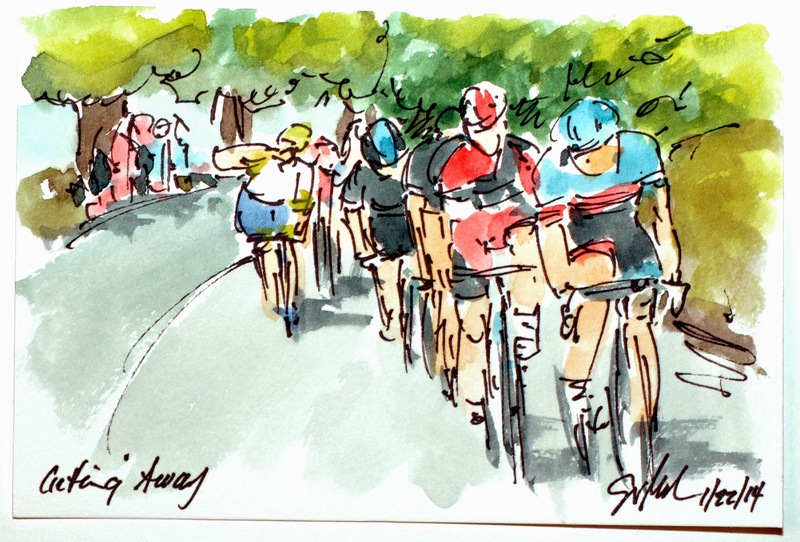 I am excited to start my season of painting the peloton along with the Pro Tour getting started in sunny warm Australia with the Tour Down Under. The first break of the day jumped out at the drop of the flag with William Clarke and Neil Van Der Pleog managing to hold off the peloton until 19 K and the start of the Menglars Hill climb. 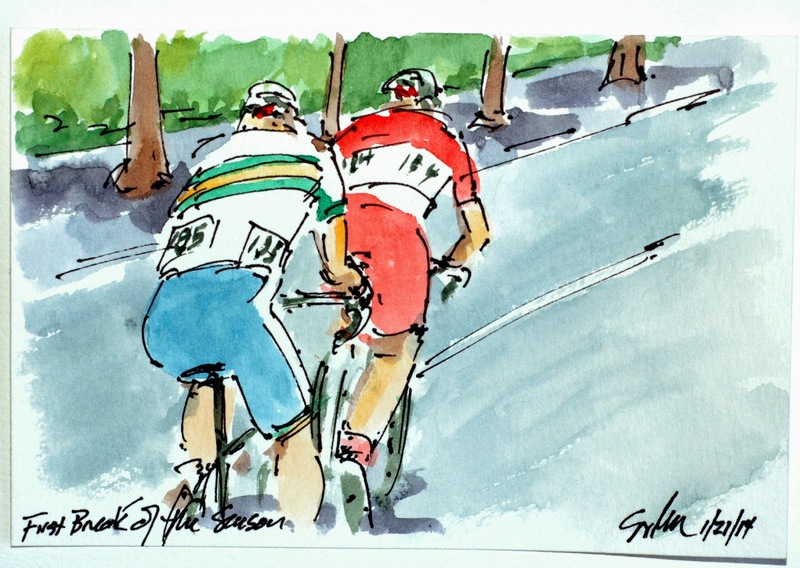 This is an original watercolor and ink postcard painted from a live broadcast of the TDU that I have accessed from www.cycling.tv All of the works in this series are created using cake watercolors from www.richesonart.com and can be purchased from me at my artist website, www.greigleach.com, just look for the Tour Down Under Gallery or follow the direct link at the end of this post.